Dave, youre a Mac guy. best way i can describe it is a factory computer is a Mac, the aftermarket computers are Windows vista. yes, Clay. its all about being able to tune everything. sometimes, the engine does weird stuff and you just cant tune it out. if its just a weekend driver or race car, its no big deal. when its something thats driven regularly, that weird little quirk on startup or being too fat at idle just gets old. we have a 2.0xfi in one car. it has the hilborn stacks on it. maybe thats why its such a pain to tune. it never seems to be "right". something else that bugs me is that everyone says you need at least 200 miles on a FAST EZ EFI for it to learn and start running right. i find that odd because i can put a MSD Atomic EFI on a car and it runs great within the first few minutes of driving. Funny you mention the 2,0 with the Hilborn.. My Uncle just within the last 8 months sent a 40 Willys he did the chassis and wiring that had a 6-71 blown 392 with the Hilborn on it and they didn't have a clue.... We spent hours and finally both my Uncle and I had to throw in the towel. Back to Reno it went and I guess it runs? Paul, its just like anything else. once you learn how to deal with the odd quirks, its not so bad. i dont like them because i have been spoiled with OEM computers. FYI, i didnt really have much luck with the ProJection back in the day . ok now that puts it in perspective. The math points to 28psi being enough. I guess I'll see. another issue im having with the FAST system is that occassionally, when cranking, it will crank against itself like timing is too high. watch the timing table and you will see it jump from idle timing over to 5000rpm where timing is 35°. im told its caused by interference from the ignition. i really dont know what im supposed to do about that. i do have to keep all of those components in the same car. i cant give everything its own zip code. So did the increased pressure do the trick? 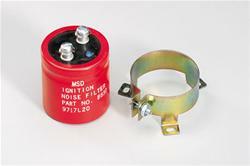 MSD makes a noise suppression cap part number 8830 that should take care of the noise. I have one on my car to suppress stray tach signals being generated by the ignition system. I guess knowing all the tricks is why this projection system is working for me. Have not had any time to check it. My cousins mustang is apart with a cracked plastic intake at the thermostat housing. I have some of the parts laid out on the car but should be able to test possibly this week. I might have to fatten up the mid-range a bit too as it was set a bit lean to avoid the idle down issue when it is too rich. Makes perfect sense if it is using an MSD box. Tach signals from it are tripled at low rpms so it might think it is spinning at a higher rpm if they get to the computer. the starter make sense but not with the MSD box. we had it running without one and it did the same thing. i was actually hoping the MSD box would help. it doesnt seem to affect the fuel tables. just timing. could be something weird from the starter circuit. i didnt wire this car. may have the EFI on the same power feed. i dont know. i have tried to separate everything but theres only so much you can do on a complete car. i was looking at it today. it doesnt do it every time. about one out of three. if i come up with anything, ill start a thread. i dont want to hijack Pauls. Snow tires are on and weather is not good. Might have to wait till spring at this point. Looks like we have enough fuel delivery with the old Pro-Jection. I know everyone asks why keep it? I just emailed Tech at Fast (EZ-EFI 2.0) about the Wide Band O2 sensor. Interesting answer too. I asked what happens when the sensor fails due to leaded fuel contamination? Does it just use the fuel map that is stored to get you home without having to tow it? Like all factory equipped EFI systems have a limp home mode that is drivable and usually not too far off of tuned. "It will still work, but it will read lean and over fuel the motor. The best thing to do is keep a spare O2 sensor in the car. There is no way around keeping the O2 sensor from fouling out from leaded fuel." I have been in the business a long time now. I would expect with a system of this caliber that there would be a limp home mode in the case of an O2 sensor failure. Like any fuel injected car from the manufacturer there is a limp home map stored for basic safe operation. Looks like there is still a bit of homework that someone missed there. Over fueling the motor is not good for the rings and bearings. Besides drinking that 10.50/gal gas like it is water in this instance. I'll keep my simple old school system thank you very much. Now it gets even better. Latest response is even more disturbing. The OE tunes like that are set tunes for certain motors. This is a universal self learning kit that has no set tune. It is constantly learning and adjusting itself. There is no set limp home since this kit will work with any motor. The system will still run, but it will read lean and over fuel since the lead will eventually foul out the O2 sensor. OE or not. Once is it close to tuned or at a point that the owner can say this is ok for a get me home tune the system should at a minimum be able to store it. This is purely as a fallback tune in case of a sensor failure of any kind. Seriously a simple thing like this won't leave you stuck. It can go on tuning as a constantly self learning system with sensors that are functional. If I did buy a system it would need to provide me with a free AAA membership.